As part of the 150th Birth Anniversary celebrations of Mahatma Gandhi, the Embassy of India in Kathmandu is organizing Jaipur Foot/Knee Artificial Limb Fitment Camps in Kathmandu and Navalprasi Districts of Nepal from 13 January 2019. The Camps are being organized under the Ministry of External Affairs, Government of India’s Indian Technical and Economic Cooperation (ITEC) Programme in collaboration with Bhagwan Mahaveer Viklang Sahayata Samiti (BMVSS), Jaipur, India and Chuadhary Foundation of Nepal. 2. 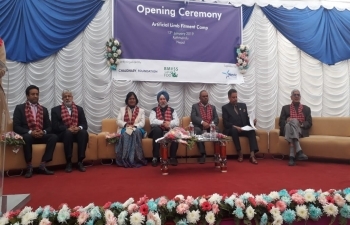 On 13 January 2019, Ambassador of India to Nepal Shri Manjeev Singh Puri inaugurated the Camp at Norvic Hospital in Kathmandu. A number of dignitaries, including Shri D.R. Mehta, Founder and Chief Patron of Bhagwan Mahaveer Viklang Sahayata Samiti, Jaipur, India and Mr. Binod Chuadhary, Member of Parliament and Chairman of Chuadhury Foundation, Nepal were present during the inaugural ceremony. The dignitaries handed over custom-made Jaipur Foot to amputees. The Second Camp will be organised in Sahaj Community Hospital, Gaidakot, Nawalparasi District. A total of 500 people with disability will be provided with artificial limbs free of cost during these Camps. 3. While we celebrate the 150th Birth Anniversary of Mahatma Gandhi, the Ministry of External Affairs, Government of India has launched an 'India for Humanity' Initiative to honour Mahatma Gandhi for his service towards humanity. The Initiative focuses on Mahatma Gandhi's philosophy of compassion, caring and service to humanity through a yearlong series of artificial limb fitment camps globally in collaboration with Bhagwan Mahaveer Viklang Sahayata Samiti (BMVSS), Jaipur. 4. Founded in 1975 and better known by its trademark "Jaipur Foot”, BMVSS is among the world’s largest organisations for the fitment of artificial limbs and till date has served over 1.73 million amputees with disability in India and around the world. The Jaipur Foot is the most used artificial limb in the world. BMVVS jointly developed the Jaipur Knee with Satnford University of the USA. The Time magazine in 2009 rated it as one of the 50 best inventions in the world.